We are trying to develop pur own quantized mesh generator and visualize these terrain tiles on CesiumJS. 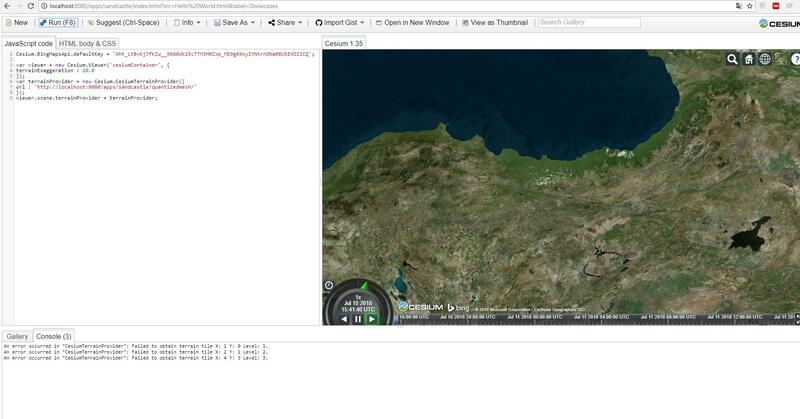 As an input we use SRTM data that belongs to north parth of TURKEY. We generate contours on DEM, extract points from contours and triangulate points using Delanuay algorithm. Finally we tile data according to TMS specification and encode data to terrain files. When we attemp to visualize these terrain files on CesiumJS, we receive some errors. We tile data for zoom levels between 10 and 16 because our region is relatively small compared to world. But while we are zooing to our region cesium requires tiles that are not in our zoom range and after a while when we keep zoom in everything disappears. We couldn't figure it out why this happens. Here is some pictures describe situation before and after a zoom. The open source project Tin-Terrain might be of help. It is a simple command line tool that we have just released. It will generate quad-tree tiled TIN quantised meshes that are directly compatible with CesiumJS. Not the answer you're looking for? Browse other questions tagged dem terrain tin cesium or ask your own question.